Garlic has played multiple roles throughout its long history with mankind. It is food, disease preventative, flavouring agent, health preserver, and health restorer. Garlic has long been associated with beneficial therapeutic effects and recommended for treating wounds, foul ulcers, pneumonia, bronchitis, indigestion, and gastrointestinal disorders. It is an effective antibiotic on bacteria, fungi, and viruses. The benefits of garlic are numerous and therapeutic, most closely associated with allicin, an external and intestinal antibiotic. Culinary-wise, garlic simultaneously flavours, helps prevent spoilage, and contributes to the health of the consumer. 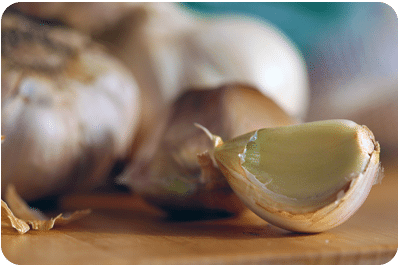 Numerous sulfur compounds are found in garlic, providing a range of therapeutic benefits such as reduction of blood pressure, anti-cancer, and immune system effects. Studies indicate that garlic has a cholesterol-lowering effect and has been known to promote cardiovascular health. Garlic inhibits the formation of free radicals, supports the bodys radical scavenger mechanisms, and protects LDL (bad) cholesterol against oxidation by free radicals. This antioxidant effect is an aspect of garlics overall protective benefit for the cardiovascular system. e.g. The radicals present in cigarette smoke are reduced by garlic.